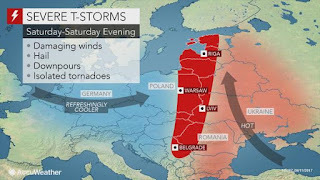 Five people, including two Girl Guides, have died in freak accidents as violent storms hit Poland amid a heatwave. The two girls, aged 13 and 14, were crushed by falling trees while sleeping in a tent when a storm hit the campground for Girl Guides and Boy Scouts in the northern village of Suszek. Another 20 children were said to have been injured. A woman died when a tree hit her house in the northern village of Konarzyny. In a nearby village, a man sleeping in a tent also perished after being hit by a tree brought down by high winds. Authorities in the same region also confirmed the death of a fifth victim, a 48-year-old man, crushed by a tree.